Give your kids the gift of song! Jam-packed with jumpin' classics, this live-action collection offers hours of fun for your children. They'll sing and dance along to favorite motion songs, patriotic tunes, spirituals, nursery rhymes, and animal anthems. 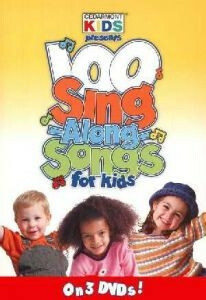 With 100 classic children's songs and Sunday school songs, this collection offers hours of wholesome, interactive fun. Your children will want to see these all-time favorite songs--performed by the famous Cedarmont Kids--over and over again. Includes 3 slipcased DVDs, approximately 53 minutes each, and is recommended for ages 3 to 10.